There is a great book that has been recently published and that brilliantly deals with the coevolution of technology, business, and society. 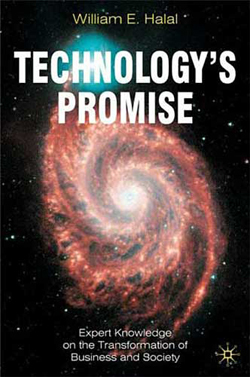 Technology’s Promise: Expert Knowledge on the Transformation of Business and Society is a concise but complete “history of the future”, covering most scientific and technological fields, with specific scenarios until 2050 and with general ideas for the future of humanity. This truly fascinating book by William Halal is a summary of his current research aided by an expert panel of about 100 futurists around the world. Halal was educated as an aerospace engineer who served as an Air Force officer, worked on the Apollo Program and in Silicon Valley, and has always been following science and technology and its impact in the “real world”. Halal is already a respected author with popular books such as Internal Markets: Bringing the Power of Free Enterprise Inside Your Organization (1993), The Infinite Resource: Creating and Leading the Knowledge Enterprise (1998), and The New Management: Bringing Democracy & Markets Inside Organizations (1998). His new book now builds on his cumulative experience and that of his TechCast expert panel, which Halal founded a few years ago. TechCast can be described as a virtual think-tank that tracks the technology revolution and its impact on humanity. The TechCast Project at George Washington University has developed a sophisticated Web site that surveys 100 high-tech executives, scientists, engineers, academics, consultants, futurists, and other experts around the world to forecast breakthroughs in all fields of science and technology. The TechCast Project strives to be the most complete forecasting system available, covering the entire span of technological innovation and updated constantly. The current global TechCast results, blended together in a masterful way by Halal with his futurist ideas and visions, are the basis of Technology’s Promise. Halal begins his book with an excellent guide to the present technological revolution, followed by specific chapters about the most important technologies and their direct impacts on business and society. He then carefully reviews most of the major areas covered in the TechCast Project, namely: energy and environment, information technology, E-commerce, manufacturing and robotics, medicine and biogenetics, transportation, and space. Each chapter of Part I: Forecasts of the Technology Revolution makes an excellent summary of current developments and future possibilities in each field. Ch. 9 An Age of Consciousness: The Next Phase in Technology’s Promise? The book is really a masterpiece that must be read by people seriously interested in the future, and even those who only want some glimpses of many things to come. I thoroughly enjoyed reading Halal’s book, even if I might be more radical in terms of the speed and the changes that are happening. For example, the ideas of Ray Kurzweil and the “Singularity”, the continuous acceleration of change, and the possible technological evolution of humans to transhumans and posthumans are only briefly mentioned in the book. However, I think that they are very powerful ideas that could make the future change faster and faster, and in more unpredictable ways. All in all, the possibilities considered by Halal are truly fascinating, and Technology’s Promise is a fantastic way to review the history of the future, including several intriguing time scenarios.